Users may receive the exception, below, when loading large quantities of records, posting large transactions or importing large amounts of data. 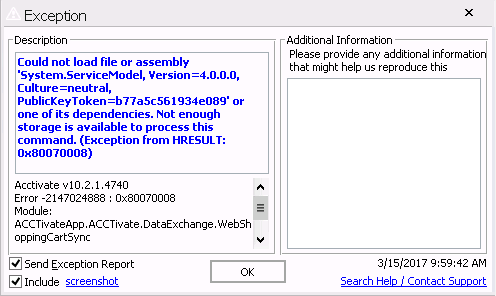 We typically find this is the result of Acctivate running on the Express version Microsoft SQL Server 2014 or newer. Express versions of Microsoft SQL Server have a memory limitation of 1GB. When working with large data sets, along with multiple users logged into Acctivate, you may hit the memory limitation of SQL Server. Run your desired process during non-peak hours where other users aren’t currently in the process of posting other transactions or running imports. Restart SQL Server, on your server, which will clear the memory cache. Upgrade Microsoft SQL Server to a Standard version of SQL Server in which there are no memory limitations.